Page 6 - Finshed Puppy Book1. weigh in appointments to properly dose the medication. 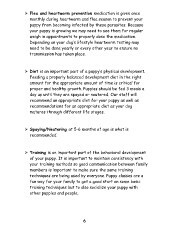  Diet is an important part of a puppy’s physical development. matures through different life stages.